Teaching Without Walls: Life Beyond the Lecture: MoblEd 09: Learning has always been mobile...right? 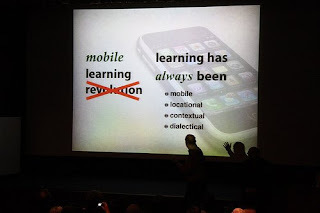 MoblEd 09: Learning has always been mobile...right? Last week's MoblEd Conference in Pasadena, CA has left me with many thoughts that I'm still pondering and will encourage myself to do so for awhile. The question, "How are mobile devices impacting education?" wasn't quite as thought provoking to me at first as it has become in past few days. The presentations at the conference were stimulating and the contextual mobile environment in which they were shared were enriching. My sincerest gratitude and applause are extended to Michael Berman and Laurie Burruss who organized the conference at Pasadena City College. Their efforts to engage a range of funding sources enriched many of the participants' experiences, as the first 60 (?) who registered received a free iPod Touch! To ensure the device became an integrable piece of the conference experience, a website was created in tandem with ConferenceConnect which facilitated easy and direct communications with mobile devices. As a presenter, I was encouraged before my sessions to set up discussion questions and share links with the participants via the site. There was even an option for poll questions to be created so participants could chime in and share their opinions on topics related to presentations. This environment was very interactive and relevant to the way our students interact. Essentially, it was a stellar learning experience for anyone associated with higher education today. This is precisely the type of experience that enables an understanding of why innovation is pertinent and necessary in education today. As many of the presenters noted, nearly 100% of college students today carry a cell phone so it makes a compelling tool to leverage for ubiquitous access to information and interactive learning. Abilene Christian University representatives -- William Rankin, Scott Perkins, and George Saltsman -- shared an intriguing presentation that showcased their efforts to contemplate how mobility could effect learning if all students had a parallel device (which is an important component to streamlining access to content, I presume). 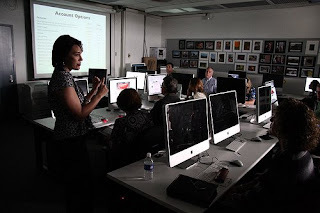 Their university provided each incoming freshman with a free iPod Touch or iPhone (the student had his/her choice) and their faculty was encouraged to integrate mobile learning activities into the freshman based curriculum. The results were compelling. The data showed strong evidence of strong engagement and satisfaction on both from both learner and the faculty perspectives. Not surprisingly, the sophomores, junior and seniors who wiggled their way into the survey weren't so keen on the idea of freshmen getting the free device, however. The piece of the Abilene Christian presentation that really provoked me the most, however, was the brief dialogue shared by Bill Rankin, Director of Educational Innovation and Professor of English (with a specialty in medieval literature might I add). He contextualized the mobile device as something not quite so new to education. As an art historian, I appreciated his historical perspective on an emerging technology. He touched upon the fact that writing in the classical period used to be preserved only through directly writing by hand on a scroll. A scroll was a long stretch of "paper" (actually vellum or animal skin) that was rolled at both ends and stretched when it need to be read. Scrolls could become very heavy and cumbersome to work with the longer the text became. At the end of the Roman period, when Christianity began to spread but had not yet been legalized, Christians needed to flee for their lives and the one item they would always desire to take with them was their scripture. This was when reading became "mobile." The need to move from place to place created a demand for a mobile "device" to transport the written word. This wasn't exactly the "birth" of the codex or the book but it was when it became more popular. Books still needed to be copied by hand, however, and it wasn't until Gutenberg's invention in the 15th century that provided for movable type and multiple copies of texts. Consequently, as books became more popular their mobility began to decline and collections of books or "libraries" began to require eager learners to come to the information rather than have the information go with them. What I take away from Rankin's message is the point that the vehicles that have been utilized to disseminate information into our society have historically been crafted out of a desire to learn and at the core of this desire is the essence of mobility, the longing to take knowledge with us. What I love about this realization is how it highlights a circle, as if some type of an organic flow or finger print of human nature, between classical times and our contemporary digital, mobile society. The other piece that is so thought provoking is the notion that colleges and universities have emerged over the past hundreds of years as centers of learning around depositories of texts to which our students have been required to arrive, in physical form, to learn. The integration of mobile applications and online learning into the foundation of our learning infrastructure actually begins to return learning to original interests that drove the popularity of the book -- well, not exactly. Most of us are not running from religious persecution, although I certainly don't intend to downplay such a serious and important topic that is still relevant in the 21st century, but we clearly have a passion to have information with us at all times. The information we seek may not be scripture but it is content that helps us navigate our surroundings, answer questions, communicate with others. Now imagine if higher all colleges and universities made a commitment to fully integrate mobile applications into education -- and I mean all aspects of education from the learning that occurs in classes (online, hybrid and face-to-face), to the communications between students/faculty/support staff, to the services we provide to our students (access to maps, research databases, registration, financial aid, counseling, etc.) 100% of college students could potentially have access to this content at all times because we know that nearly all our students have cell phones. And they take these cell phones with them everywhere, even to bed. Exquisitely, the ACU presentation was followed by a session by David Middleton and Michael Taylor of Seton Hall University who showcased the development of SHUmobile, a mobile application the university is developing to foster community and enable collaboration. Now I really don't want to end this post on a sour note but my mind has once again become painfully aware of something that concerns me. How will our public colleges (community colleges) and universities stay in sync with the private universities who have the enormous funds to support these innovative ventures. Is it a matter of not having enough funds? Or is it a matter of values and priorities? I'm wondering how many public colleges and universities have a Director of Educational Innovation on staff. Michelle - what a thoughtful and well-written summary of the meeting - thank you!